Peterson was one of the greatest virtuosos in jazz, with a technique that was always meticulous, dazzling and spectacular. His style was often compared to the great Art Tatum and Nat King Cole, who were both Peterson's childhood heroes. Yet, no matter how his fingers danced across the piano, his solos had the trademark of swing that never failed to move his audience. Nor did his massive frame show any sign of tiredness. He won eight Grammy awards, as well as numerous musical honours from across the globe. Peterson's other contemporaries and collaborators included the likes of Ella Fitzgerald, Louis Armstrong, Nat King Cole, Charlie ‘Bird’ Parker, Count Basie and Dizzie Gillespie. 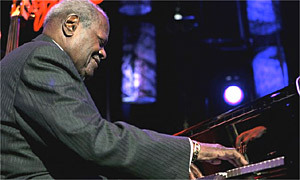 Count Basie, who collaborated with Peterson in the 1970s, said he “plays the best ivory box I’ve ever heard.” Herbie Hancock said that he moved from classical piano to jazz after being inspired by the “precision” of Peterson’s skill. But apart from his contribution to jazz, Peterson put his native Canada on the world music map and helped forge a new era in race relations in that country. He spoke out against the exclusion of <?xml:namespace prefix = st1 ns = "urn:schemas-microsoft-com:office:smarttags" />Canada’s ethnic minorities from popular media, remarking that young people are affected by images that they see on television and in magazines. Oscar Emmanuel Peterson was born in a limestone house on Montreal’s Delisle Street on August 15, 1925. He was the fourth of five children of music-loving parents. His Jamaican-born father was a porter with Canadian Pacific Railways, who learned to play piano when he was a merchant sailor. He taught all his children to attain proficiency on the keyboard from early age. By his sixth birthday, Peterson was mastering both the trumpet and piano. But a year later, he was struck down for 13 months by tuberculosis. To avoid further injury to the lungs, his father encouraged him to concentrate on the piano. It was at Montreal High School that the young Peterson came to study under a notable classical pianist, the Hungarian Paul de Marky. At age 14, his older sister, Daisy (who went on to become a world-renowned music instructor), got him to audition for an amateur competition organised by the Canadian Broadcasting Corporation (CBC), which he won. He was then offered weekly 15-minute performances on the local radio before he went national with the CBC on its ‘The Happy Gang’ show. His first recording, I Got Rhythm, arranged in the boogie-woogie style, was released at aged 19. He later joined an all-white band, the Johnny Holmes Orchestra, which toured Canada and the United States. On tours south of the border in America, he was dismayed to see that he could not be served at restaurants and hotels as his fellow band members, because of his skin colour. But he was courted by several popular jazz band leaders in New York, including Count Basie. Peterson bid his time until 1947, when the promoter, Norman Granz, came along, and directed him away from the boogie-woogle style he was noted for. In 1949, Peterson made his debut at a cameo appearance at a Carnegie Hall Jazz at the Philharmonic Show. The experience was a roaring success and Peterson soon landed a good record deal with Granz. Peterson then exploited his own versatility, talent and knowledge in wide arrays of projects, releasing nine albums in 1959 alone and over 200 in his lifetime. But his prolificacy aroused the consternation of some critics, who dismissed his work as a “stockpile of clichés…” and as “….woefully weak on emotional projection”. Yet, Peterson’s brilliance and charm succeeded in bringing jazz to many who may not have embraced it. His technical ingenuity was always evident, with little tension as he scatted and his fingers raced across the keyboard. He produced his best known work, Canadiana Suite, in 1964, which earned him his first Grammy nomination. In 1982, he teamed up with Herbie Hancock as a piano duo in concerts across the globe. It was while playing the Blue Note club in Tokyo, Japan, in 1992 that Peterson suffered his first stroke; a partial paralysis of his left side followed. But he continued to perform across the globe. His autobiography, A Jazz Odyssey: The Life of Oscar Peterson, was published in 2002. Three years later in 2005, he became the first living person, other than the British Royals, to be commemorated on a stamp in Canada. In 1960, Peterson founded the Advanced School of Contemporary Music in Toronto and was a Chancellor of Toronto's York University (1991-1893), where he was also a visiting lecturer. He published educational works for student jazz pianists. He contributed to the soundtrack to the movie Play it Again Sam (1972), hosted a TV chatshow and toured Russia in 1974. To many who knew him, Peterson was a charming, unpretentious man, who happened to be a globally-acclaimed music legend. Apart from his music and family, his hobbies included photography and fly-fishing. He is survived by Kelly, his wife of 16 years and seven children. Oscar Emmanuel Peterson, jazz pianist, born on August 15, 1925; died on December 23, 2007.